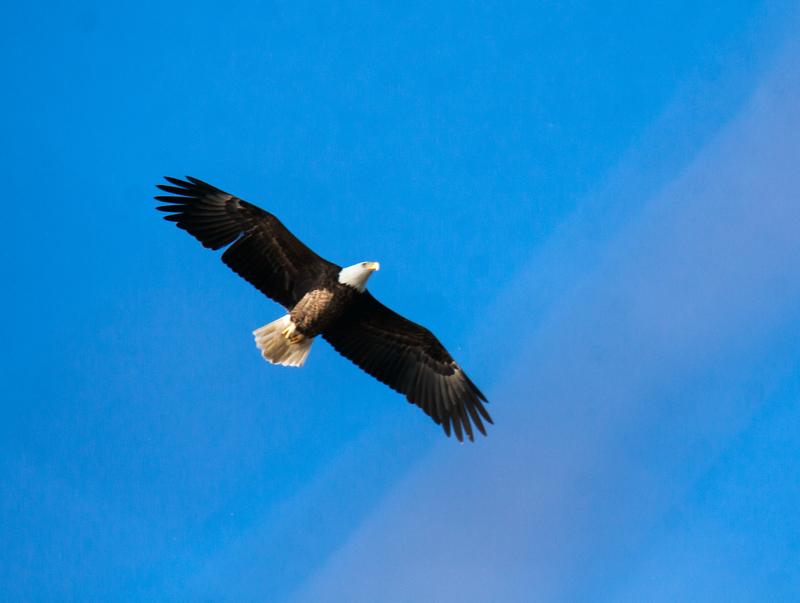 The moon rose in mid-afternoon on Fridat at Occoquan Bay National Wildlife Refuge and it looked like this Bald Eagle (Haliaeetus leucocephalus) was howling at the moon. In reality, I think it might have been calling out to its mate. As you can probably notice, I was shooting almost straight up when I took this shot. I had spotted the eagle from a distance through the branches of a tree and was able to creep relatively close to it before I had to move to an exposed position. I don’t think that the eagle had seen me yet when I took this shot, so I probably was not the cause of the eagle crying out. The image is a bit more cluttered with branches than I would have preferred, but I really like the pose that I was able to capture, particularly the details of the beak and the eye. 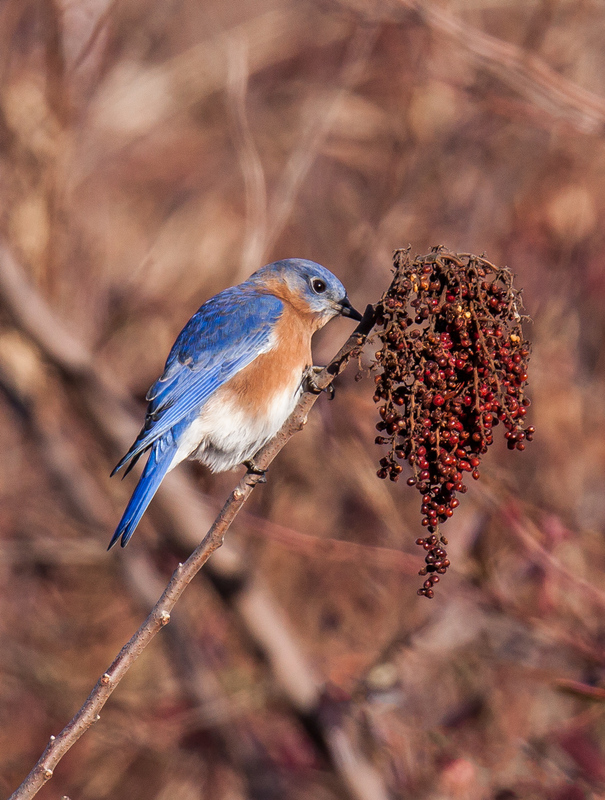 This male Eastern Bluebird (Sialia sialis) seemed to be pretty happy to have found a batch of little red berries on which to munch on Friday at Occoquan Bay National Wildlife Refuge. I am not sure what those berries are, but they undoubtedly were a welcome source of energy for the little bird on a frigid morning. I am in somewhat of a contemplative mood this morning on the final day of 2017. Five or so years ago, before I started to get more serious about photography, I might have looked at this image and wondered how it would be possible to capture a shot like this. How could I get close to such a small bird? How could I compose a pleasing image? What would I need to do to separate the subject from the cluttered background? At the start, I needed to think consciously about all of these factors and it was somewhat overwhelming. Now, thankfully, I have had so much practice that most of these factors are second nature to me and I know how to produce an image like this. There is, of course, still lots of room for improvement, for sharpening my eye and my skills, but objectively speaking I have can see a gradual progression in my photography. What does 2018 hold for me? I have no formalized plans, no set goals. I often describe myself as an “opportunistic shooter”—I like to walk around and photograph whatever I happen to spot. Location, though, does really matter and I anticipate visiting a few new places this coming year. I am starting to realize that I enjoy my wildlife photography most when I am more or less on my own. Popular locations often have too many other people for my personal sense of comfort. When faced with the choice of going to a place with more wildlife (and more people) or one with less varied wildlife, I increasingly find myself opting for the more isolated area. Best wishes to all of you for a blessed 2018. Happy New Year. 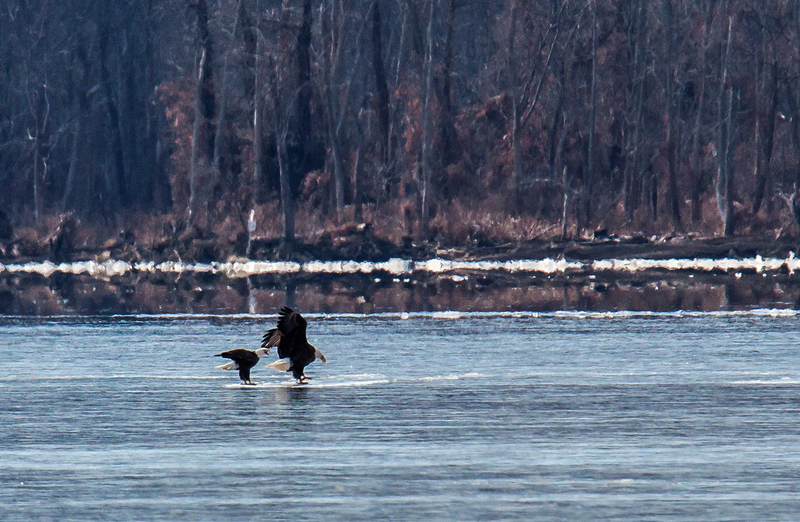 As I was tracking a pair of Bald Eagles (Haliaeetus leucocephalus) yesterday in the sky over Occoquan Bay National Wildlife Refuge, I was surprised when they landed in the distance on the ice. I have no idea why they did so, but they stood there on the ice for a long time. Were they just chilling? Did they want to try ice skating? Could they see a fish through the ice? I have lots of questions and few answers, but it was definitely a cool sighting. 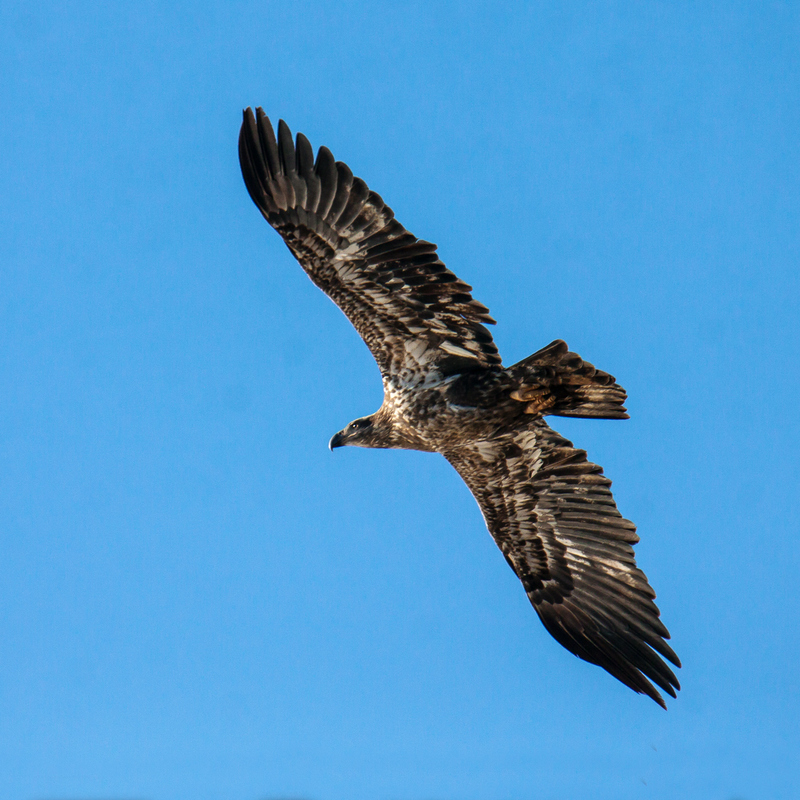 Folks with more experience can tell the age of this immature Bald Eagle (Haliaeetus leucocephalus) from its colors and the pattern of its plumage. 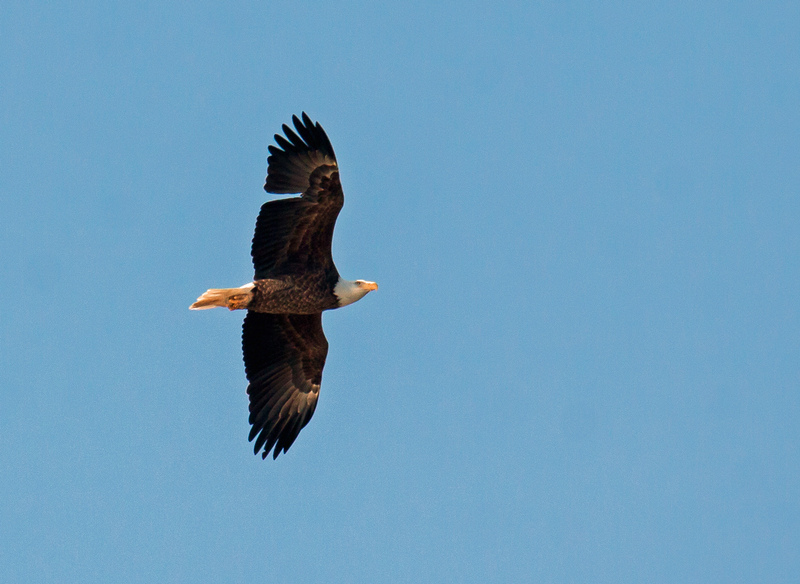 As for me, I was thrilled to get a shot of it when it flew over me yesterday at Occoquan Bay National Wildlife Refuge. 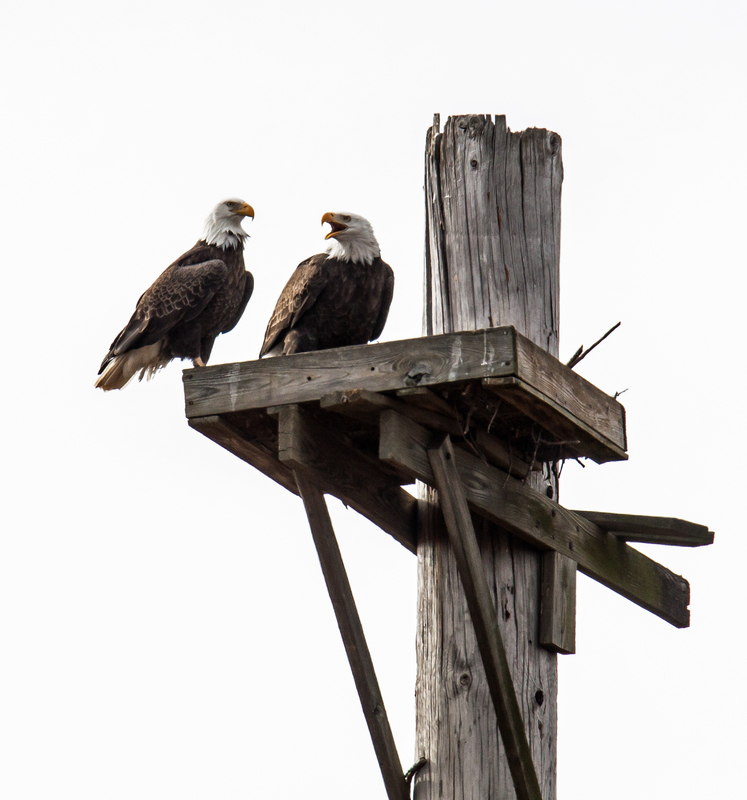 I found a helpful posting on-line, A Guide To Aging Bald Eagles by Ron Dudley, that provides helpful tips and photographs for determining the age of an immature Bald Eagle. I am not completely certain, but it looks like this eagle may be in its second or third year, though I would welcome a correction or clarification from someone who has more experience with birds than I do. 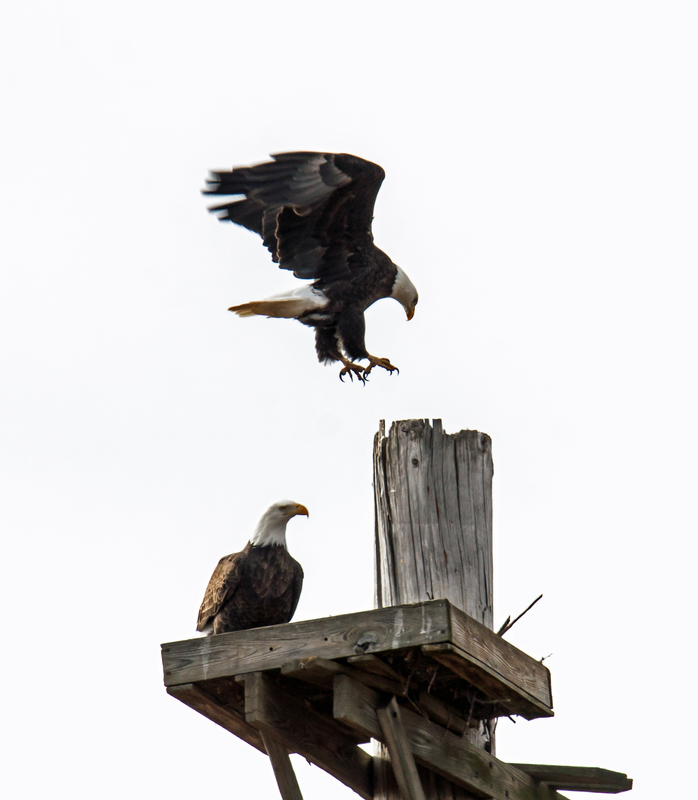 A Bald Eagle (Haliaeetus leucocephalus) perched on the top of a post this morning at Occoquan Bay National Wildlife Refuge looked for a moment like it was going to pounce on another eagle that had just landed on a platform attached to the post. 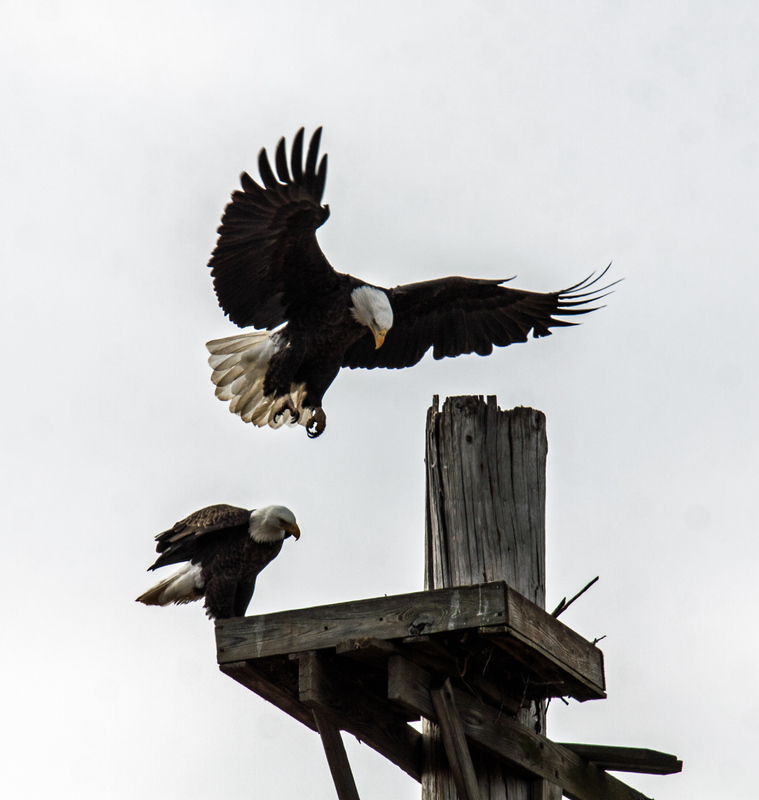 Apparently the larger eagle, almost certainly, decided she had something to say to her mate and was merely hopping down to his level and she landed really close to him. 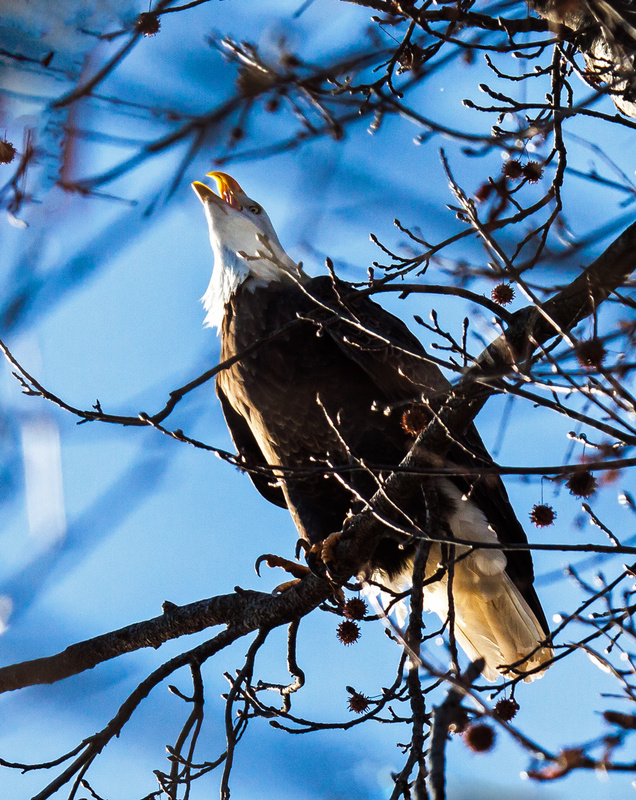 The female eagle seemed unhappy with him and made several loud cries in his direction. He just stood there and took it and in the third shot has the look of a henpecked husband. Apparently she also told him that he needed to perch on the upper post. 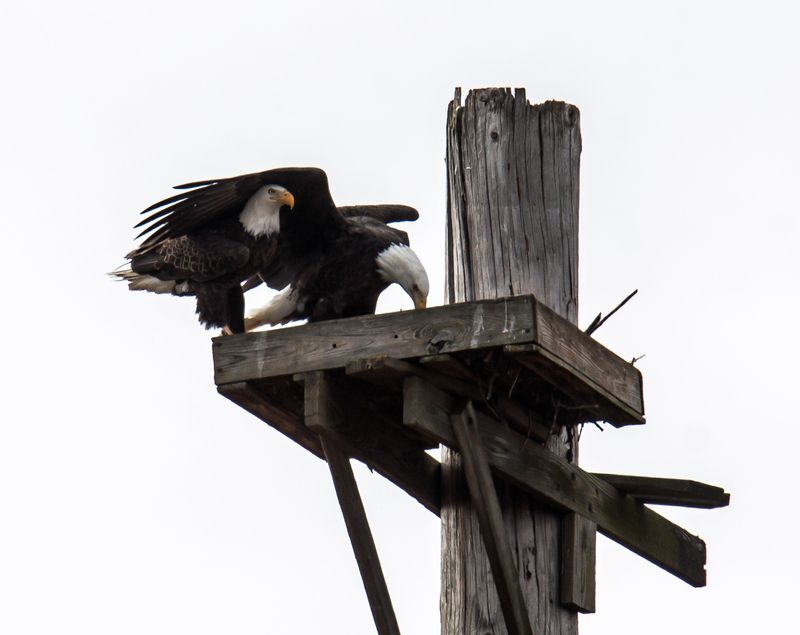 Perhaps this is the eagle equivalent of sleeping on the couch. 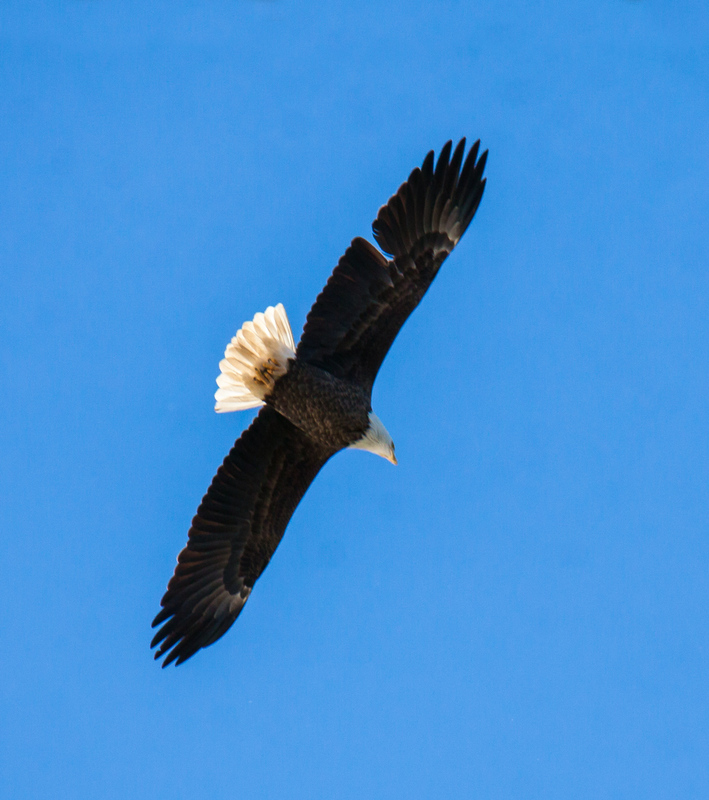 The wind was blowing hard on Christmas Day at Occoquan Bay National Wildlife Refuge and one of the Bald Eagles (Haliaeetus leucocephalus) took to the sky, spread its impressive wings, and effortlessly soared above me for a short while. I really enjoyed the Christmas show. I am not sure why this Great Blue Heron (Ardea herodias) was sticking out his tongue at me on Monday at Occoquan Bay National Wildlife Refuge—maybe this is how herons wish each other Merry Christmas. I have gotten glimpses of a heron’s tongue before, but there is the first detailed look that I have had. 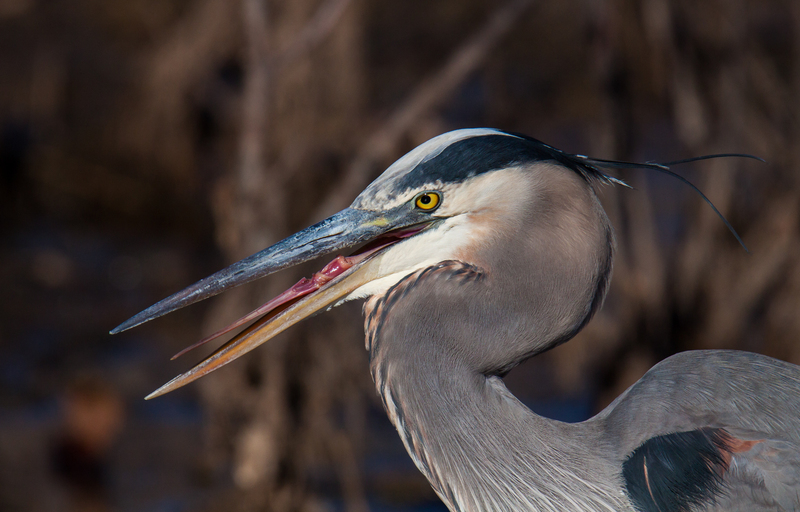 I am amazed at the way that herons are able to swallow their prey whole and imagine that the tongue has to be tucked away somewhere within its mouth when doing so. When I look at this image, it looks like the heron is singing, perhaps bringing tidings of comfort and joy and wishes for peace on the earth.